Guardian Angels is thrilled to be recognized for our electronic communication efforts. 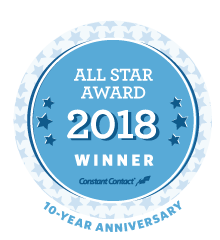 New efforts have been launched in recent years to keep our parish and school families engaged and informed about news and events happening at GA. Those campaigns and your response helped us nab the All Star Award again. Thank you for reading our emails, clicking on links provided and participating in any necessary surveys! That engagement is what makes GA stand out! More than 650,000 small businesses and organizations use Constant Contact each year. Guardian Angels use this web-based platform to send weekly school newsletters, monthly parish newsletters, manage event registrations, and much more. School families are signed up for emails at the start of each school year. Parish families can register by clicking the sign-up button on the homepage of the parish website or through the office when they register at the parish.